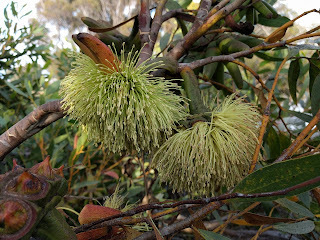 Eucalyptus conferruminata: Eucalyptus from the Greek, meaning “well-covered,” referring to the fused lid over the flower before it opens (called an operculum); conferruminata meaning "joined together," referring to the seed pods being fused together in clusters. 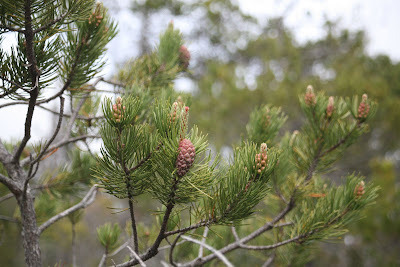 Pinus pseudostrobus var. 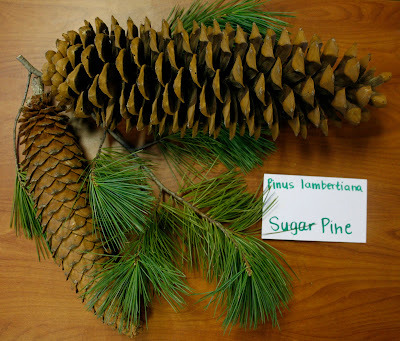 apulcensis: Pinus is the Latin name for P. pinea; pseudostrobus for its similarity to P. strobus; apulcensis, meaning 'from Apulco,' where it was first collected. Also known as P. oaxacana. Elegant tree 40-50 meters tall with a round to cylindrical dome. 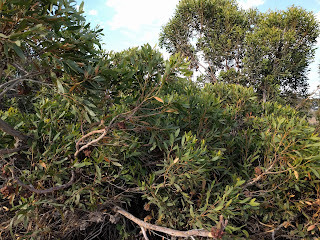 Numerous thin, gently rising branches are clothed with drooping foliage at the tips. 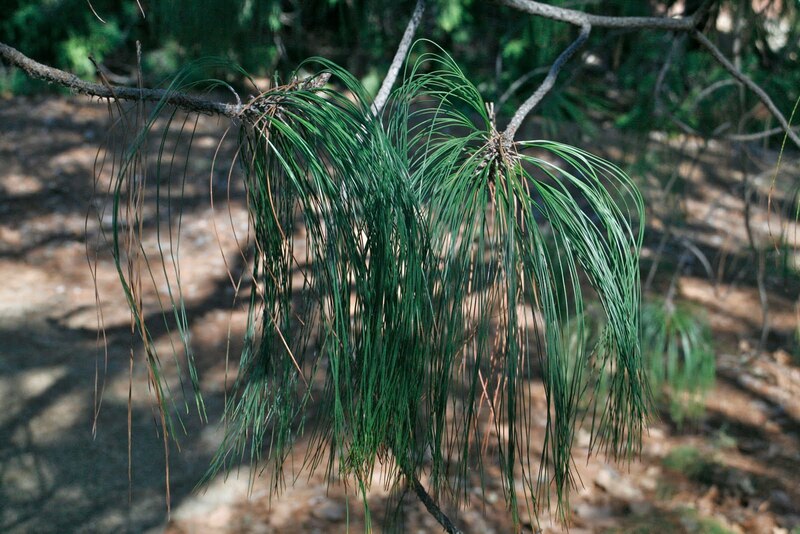 Dark yellow-green to bright green to glaucous blue-green needles are 20-40cm long and bundled in fascicles of 4 or 5. 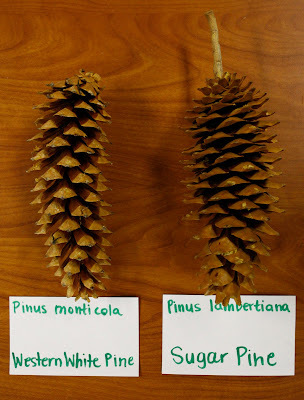 Seed cones are 10-15 cm long. 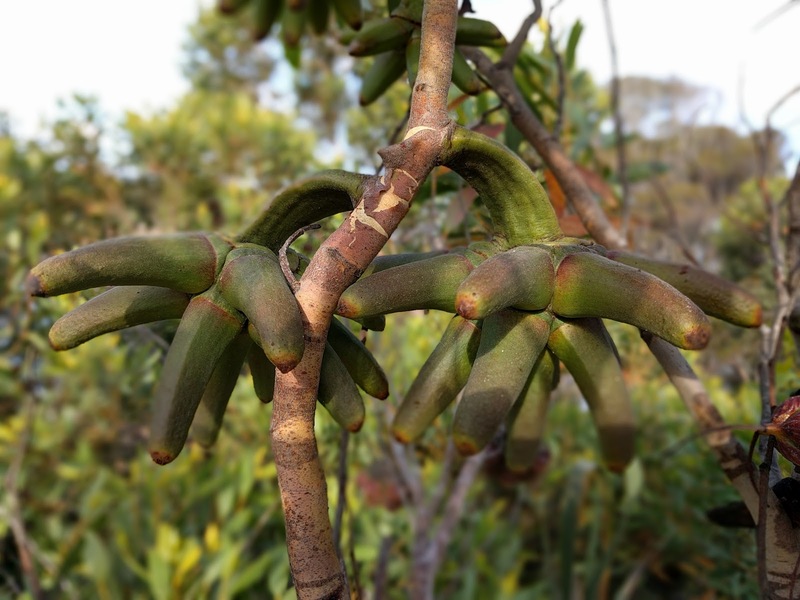 Seed scales have a long, up-turned claw-like umbo sometimes tipped with a small, fragile prickle. 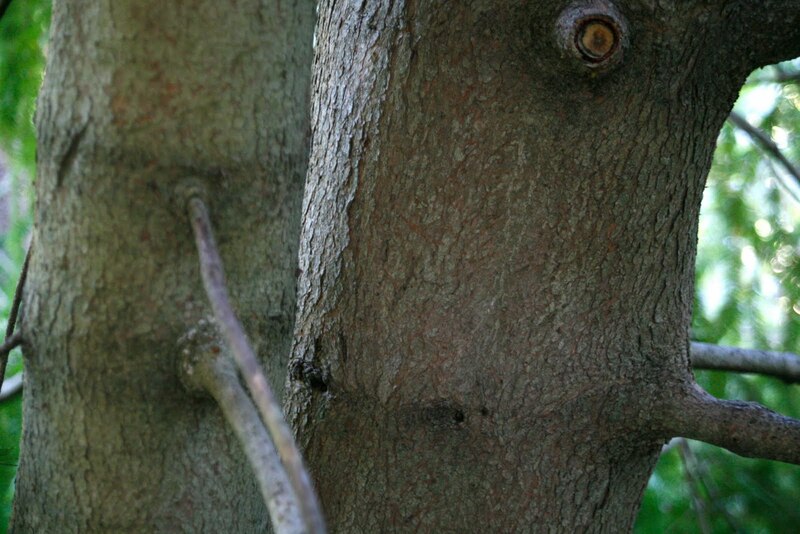 Note the long (20-30mm) sheaths binding the needles in fascicles. 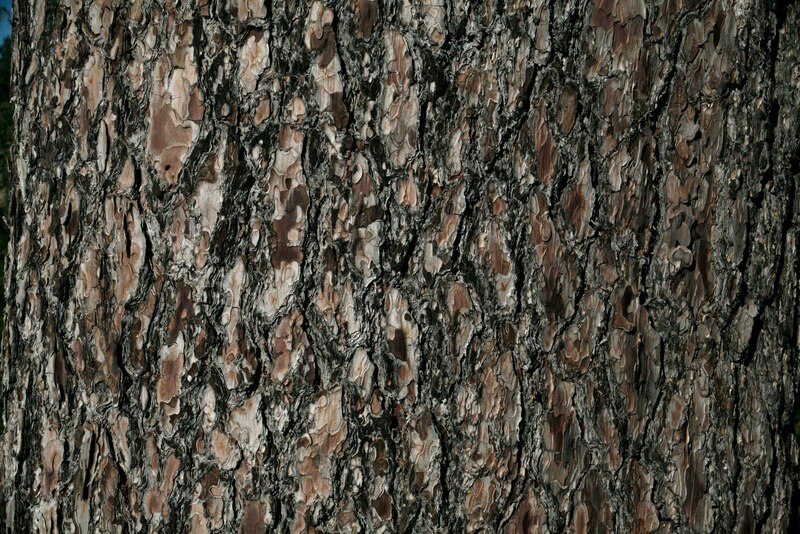 Smooth gray to reddish brown bark becomes platy with maturity. 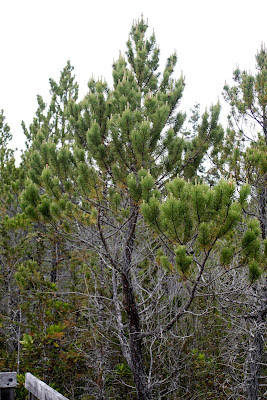 Pinus contorta ssp. 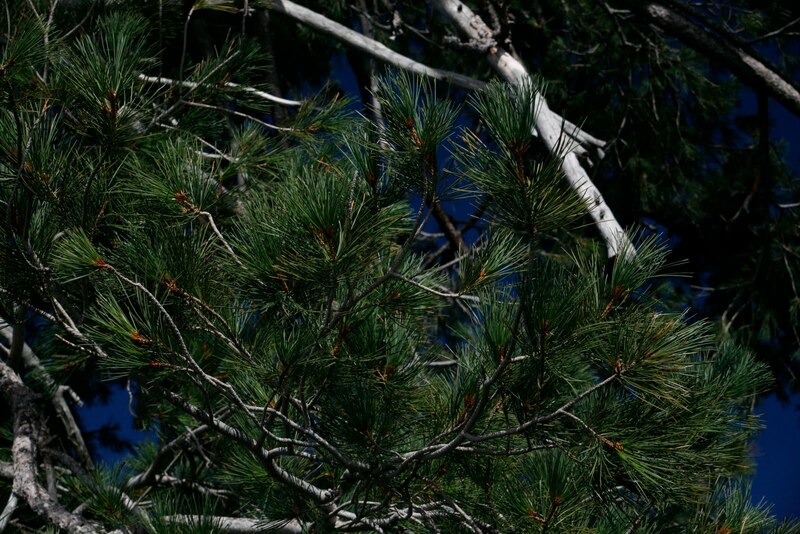 bolanderi: Pinus is the Latin name for P. pinea; contorta or 'twisted,' referring to the species' twisted needles; bolanderi, named after Henry Nicholas Bolander (1831-1897), a collector of plants in Yosemite National Park and California State Botanist in 1864. This subspecies is endemic to the Pygmy Forest in Mendocino Co., California where there are coastal terrace soils with claypan or hardpan. It is closely related to P. contorta contorta and P. contorta murrayana. 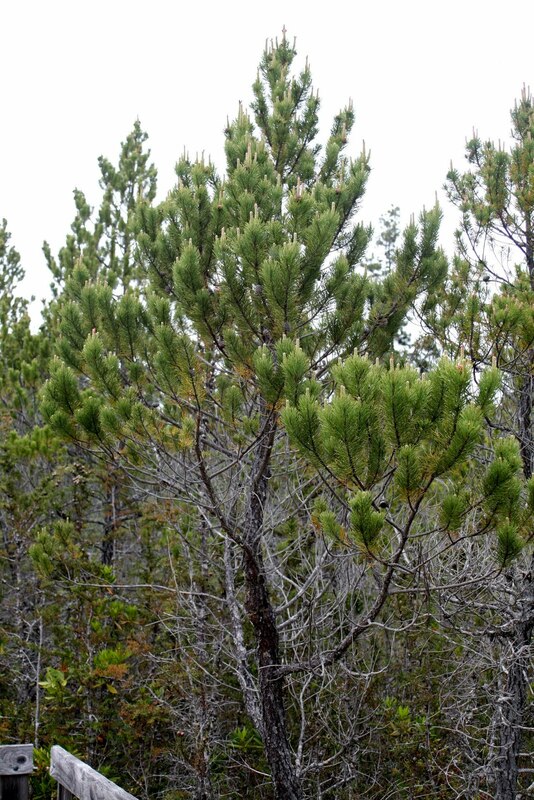 Bolander pine often grows in thickets of cane-like trees that, although very small, are biologically mature and bear fertile cones. 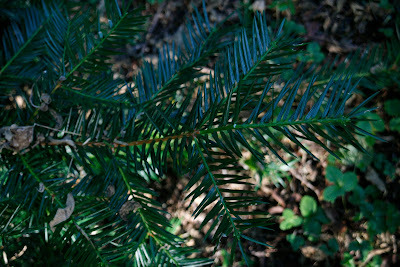 Needles 1.25-2" long, 2 per fascicle, often twisted. 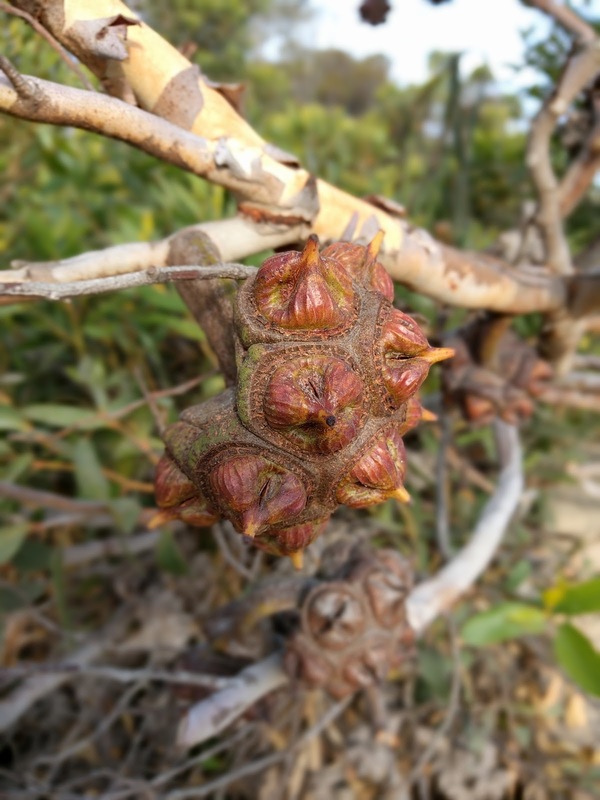 Asymmetric seed cones ~3 inches long remain closed on the stem for many years. 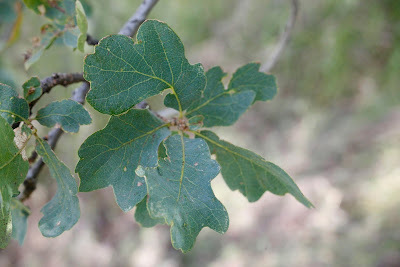 Quercus douglasii: Quercus the classical Latin name for the oak; douglasii, named for David Douglas (1798-1834), a Scottish collector from the Horticultural Society of London looking for North American plants that could grow in English gardens. Native to California's Central Valley and foothills. Slow growth to 30-50' tall or more with a 40-70' spread, developing a broad, low-branching, rounded canopy, either leaning or slightly bent, and a heavy clear trunk. Leaves are alternate, simple 1 - 1 1/2" long by 1/2 - 3/4" wide, dull bluish green, variable from broad oval to almost squarish, with scalloped edges, blunt, often bristle-tipped ends , sparsely covered with minute star-shaped hairs, often with harmless red gall-like warts on the uppersides, lighter undersides with very fine tiny soft hairs at midveins and branches and pastel pinkish orange or dull yellow fall color. Leaves are smaller and bluer than Q. lobata, which grows alongside. Yellowish-green tassel-like flowers occur in early spring. 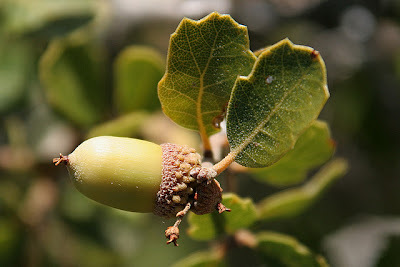 Acorns are deep brown, conical, 1/2 - 1 5/8" long by 3/8 - 3/4" wide, with a rounded, short-tipped end, a thin scaled cup covering 1/8 - 1/4 of the base of the nut, from a short-stalked base, maturing in fall of the first season, and occurring in profusion on healthy trees. 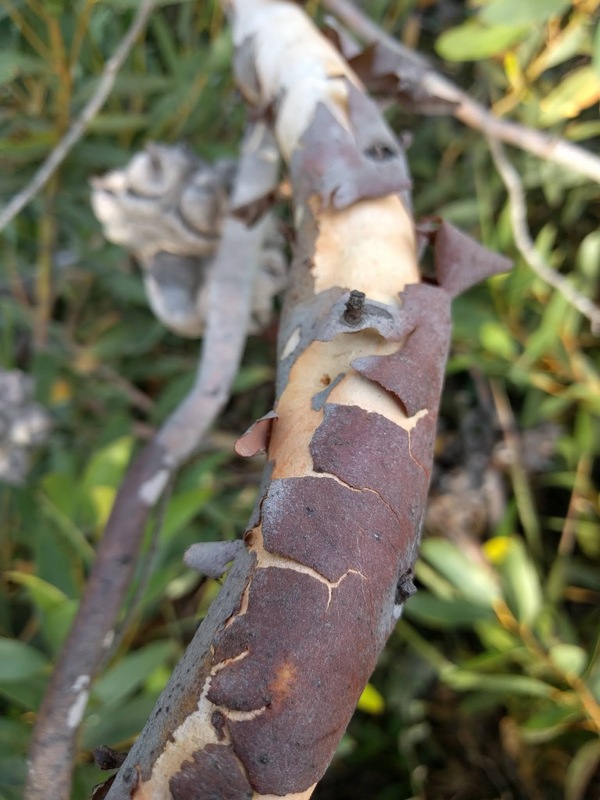 Brittle young twigs are dull gray to reddish brown with a slight minute hairiness. 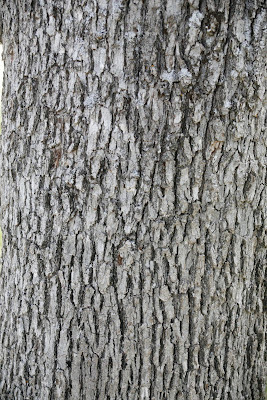 Bark is rather thin, light ashy gray with narrow ridges, peeling off easily in thin flakes. 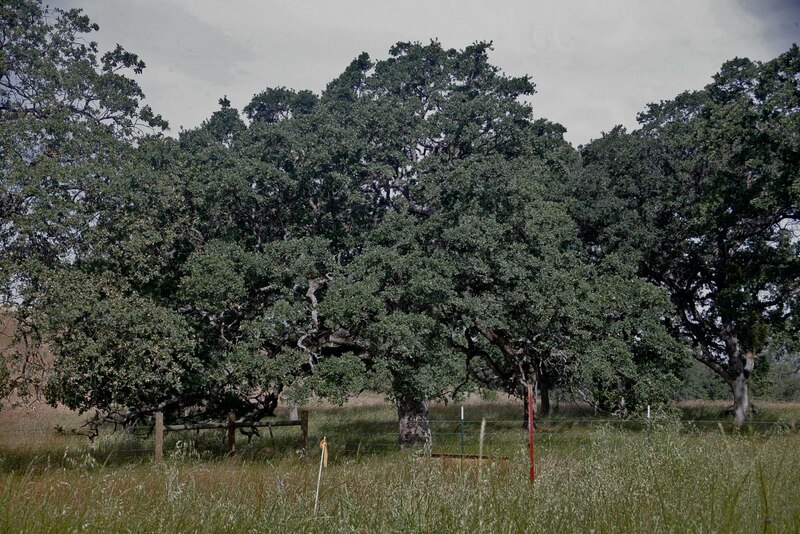 A highly desirable native oak that tolerates valley and foothill heat and seasonal drought. Longevity estimated to be 200-300 years. 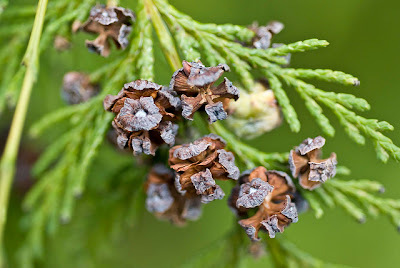 Torreya californica: Torreya named after John Torrey (1796-1873), a professor of chemistry and one of the giants of North American botany; californica from California, where it grows natively. 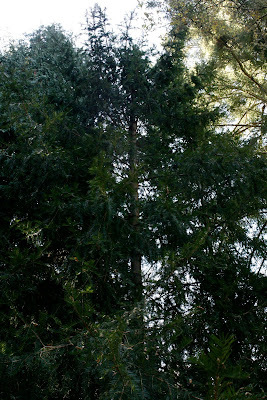 Also known as Stinking Cedar. 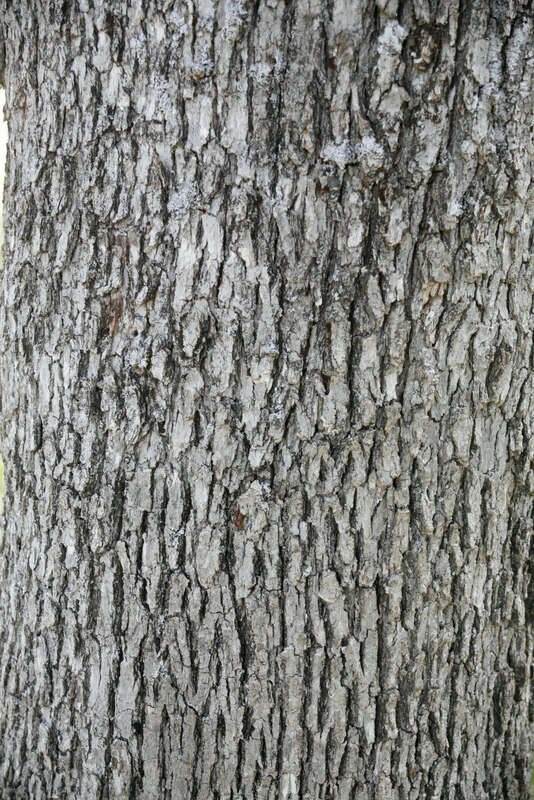 Growth rate slow to 15-20' tall (taller in native habitat) with a 12-15' spread and a trunk 1-3' in diameter. 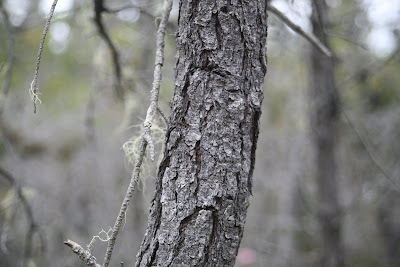 Often multitrunked with an open, broad pyramidal crown, rounded in age, rangy in forest locations, with slender horizontal branches standing out straight from the trunk in symmetrical circles, drooping at the ends. 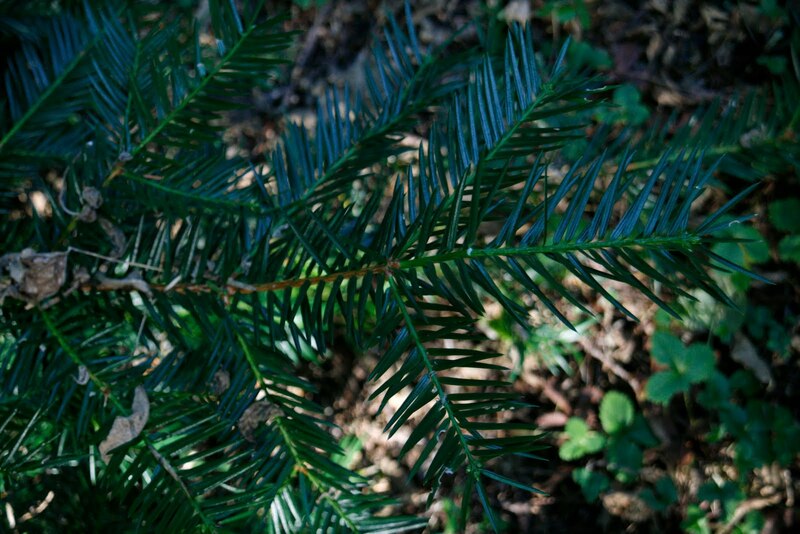 Needlelike leaves are rigid, flat, linear-lanceolate, 1 1/4" to 2" long, shiny deep green and spirally arranged and appearing flatly 2-ranked, with sharp pointed edge and two whitish bands on the underside of the leaf. 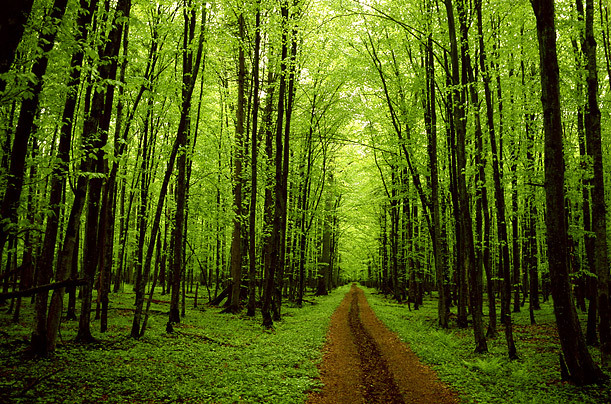 Crushed leaves have a strong scent. 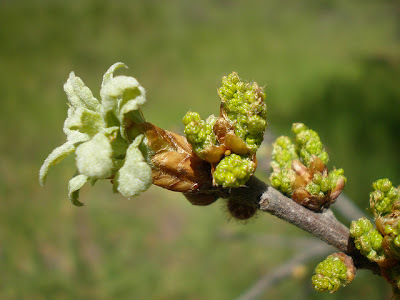 Current year's shoots are green but turn reddish brown by the third year. 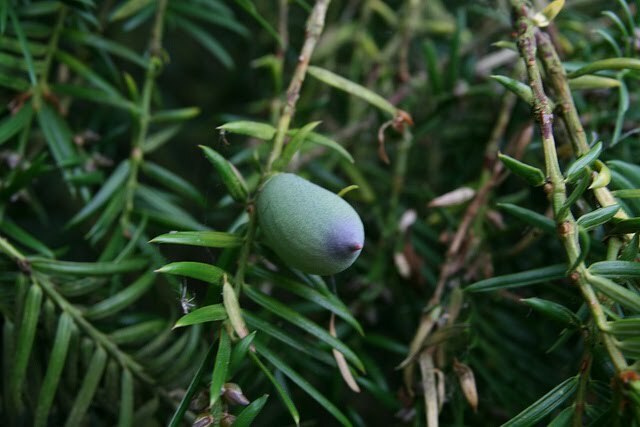 Fruits are 1-2" long, ovoid, plumlike, pale green, with purple streaks, a blunt pointed end, and wrinkled skin when matured in the fall of the second season. Seeds have a thin hard brittle shell and germinate after 2 years. 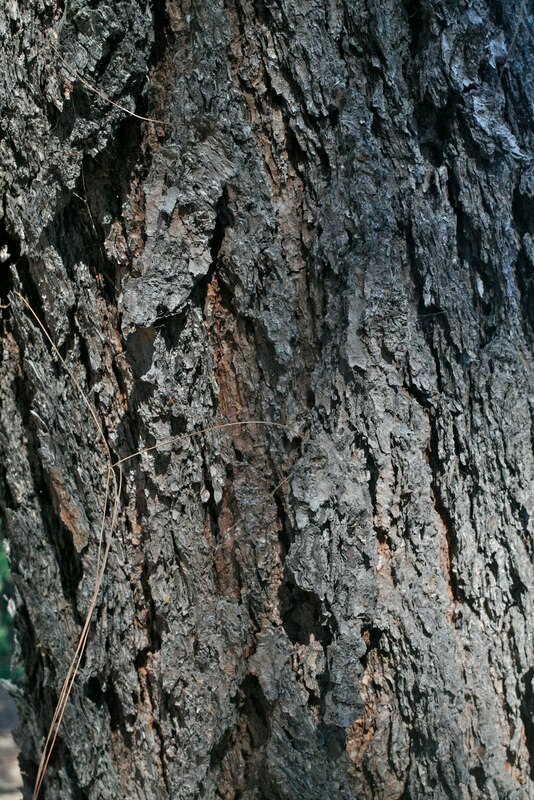 Bark is ashy yellowish brown, finely checkered with narrow seams and short, narrow, loose, scaly ridges. California nutmeg is found on moist, rocky sites within the shade of tall, coniferous forests 2,000' - 7,000'. 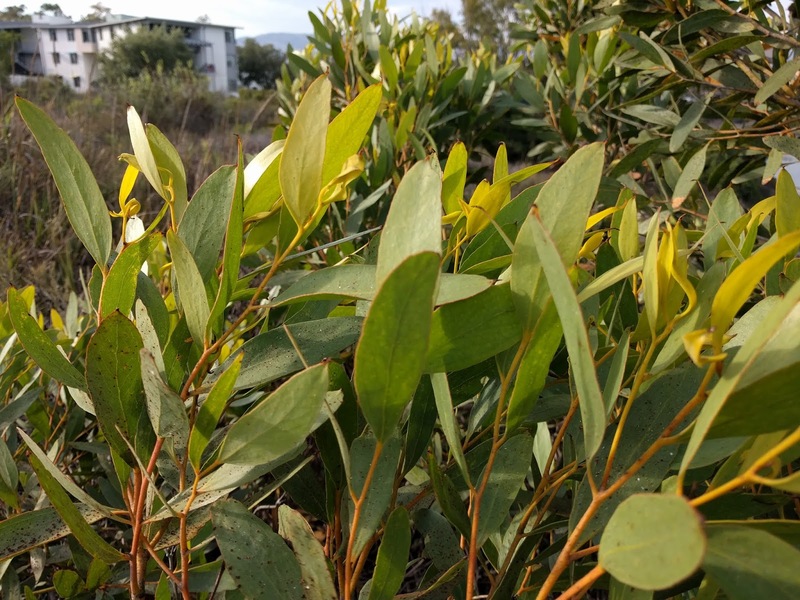 It grows as a shrub on serpentine soils. 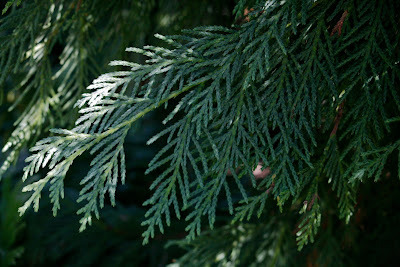 Chamaecyparis nootkatensis: Chamaecyparis Chamaecyparis from the Greek chamae, "dwarf, low-growing, or growing on the ground" and kyparissos, "cypress," meaning "dwarf or ground cypress;" nootkatensis of or from the area of Nootka Sound or Nootka Island in Alaska. 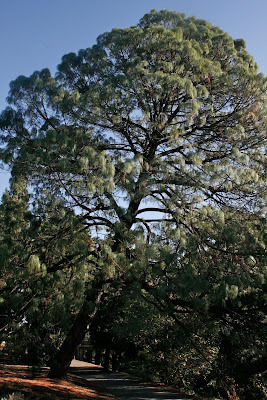 Synonyms: Cupressus nootkatensis, Callitropsis nootkatensis, Xanthocyparis nootkatensis. 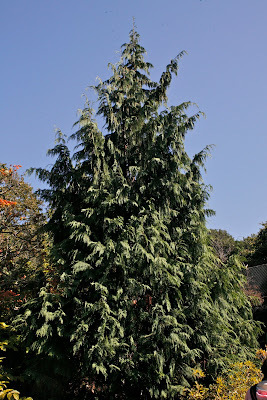 Also known as Nootka Cypress. Growth rate slow to 80' tall, though often dwarfed at high elevations, and a 25' spread at the base, developing an open, dense, narrowly conical form. 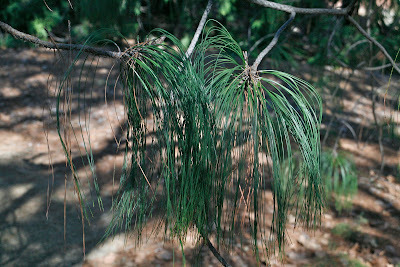 Weeping, flat sprays of blue-green to yellowish foliage have scale-like leaves with sharp, spreading tips. 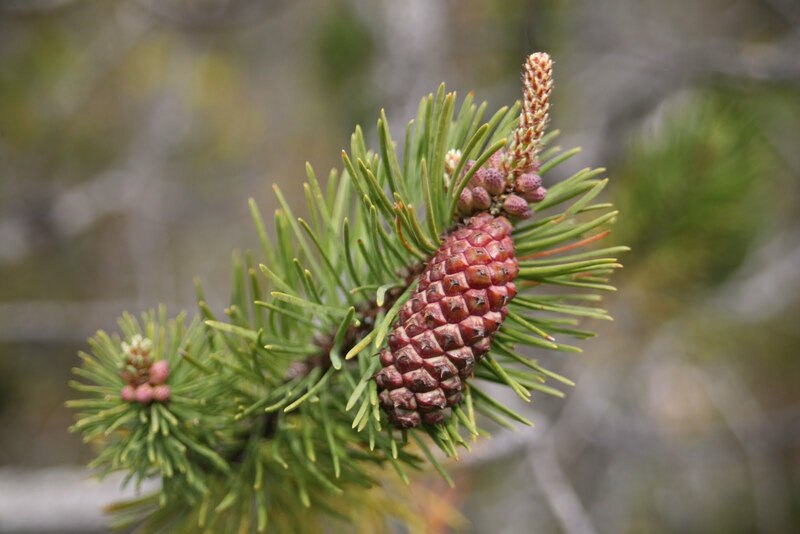 Cones are similar to C. lawsoniana with wide, flat scales opening to expose the center, but only have four to six scales. Small reddish or brown male flowers appear as swollen bulbs at leave tips, shedding pollen in spring. 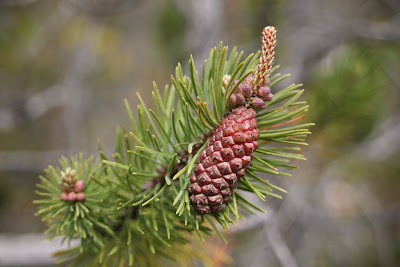 Tiny green female flowers form small, 1/4" long, round, deep cones with a whitish cast, ripening in fall. Bark is thin, brown, becoming gray with age, irregularly ad finely broken by shallow seams, with wide, flat scaly ridges, frequent diagonal crossings, peeling in narrow, flat, vertical strips. Native to the coastal mountains from southeast Alaska to southwestern Oregon, with a few small groves in California's Siskiyou Mountains making up the southern extent of its range. 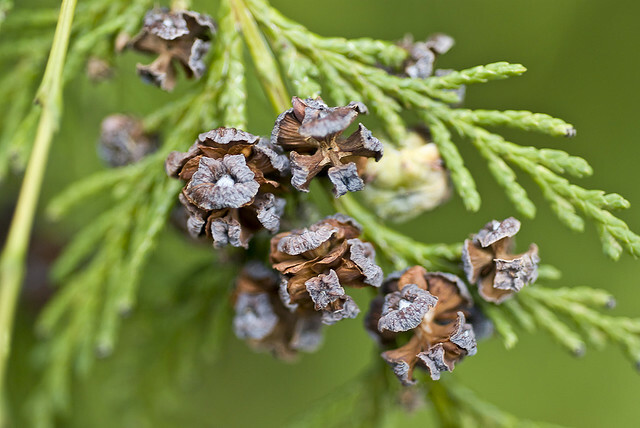 Alaska Yellow Cedars generally grow on north-facing slopes from 4,500 - 6,900' elevation and most often consist of populations of scattered shrubs of this cedar. Longevity estimated to be 200-275 years on average. 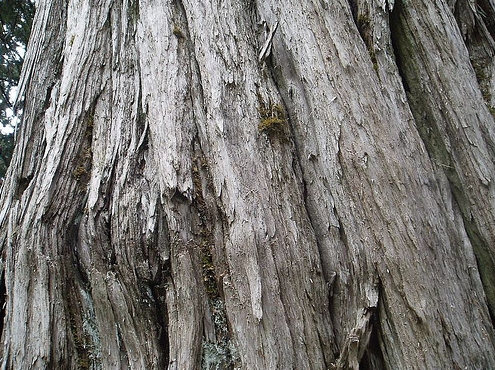 Canada's oldest known tree is an Alaska Yellow Cedar with 1,636 annual rings. It is said to have perished on Vancouver Island in the early 1990s. Pinus lambertiana: Pinus is the Latin name for pine; lambertiana, named for the British botanist Aylmer Bourke Lambert, who is best known for his work A description of the genus Pinus. 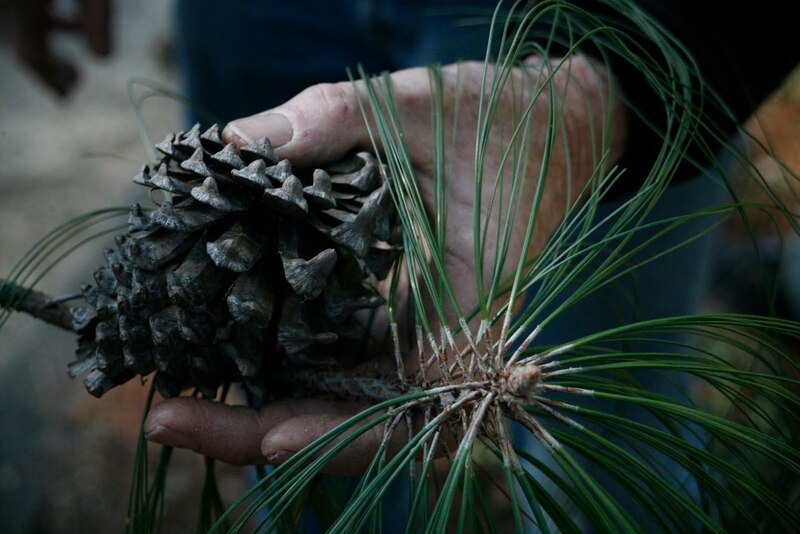 Native to the Sierra Nevada and southern Cascade Ranges at 3,000-5,000' elevation. 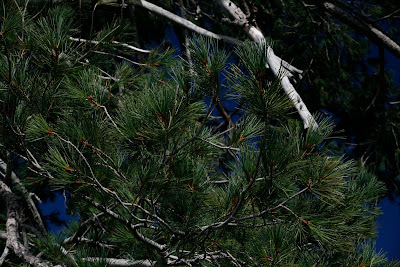 Occurs naturally among other pines, firs and incense cedars, which usually predominate. Not readily adaptable to cultivation. 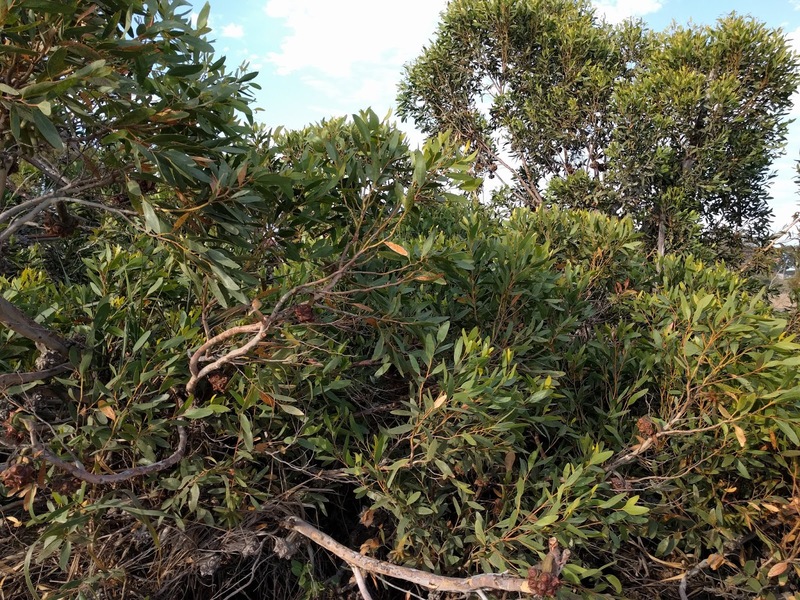 Growth rate initially slow, faster with age to 200' tall or more with a 50' spread, pyramidal in youth with slender horizontal branching and distinctively loose foliage. Older trees often developing a sizable trunk with broad sweeping limbs giving a somewhat tiered effect and long cones hanging like ornaments from branch tips. 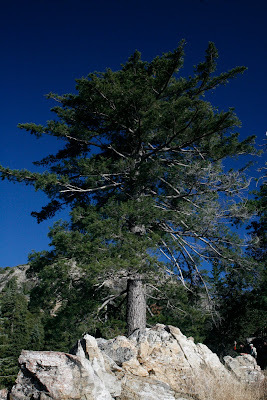 One of the tallest pines. 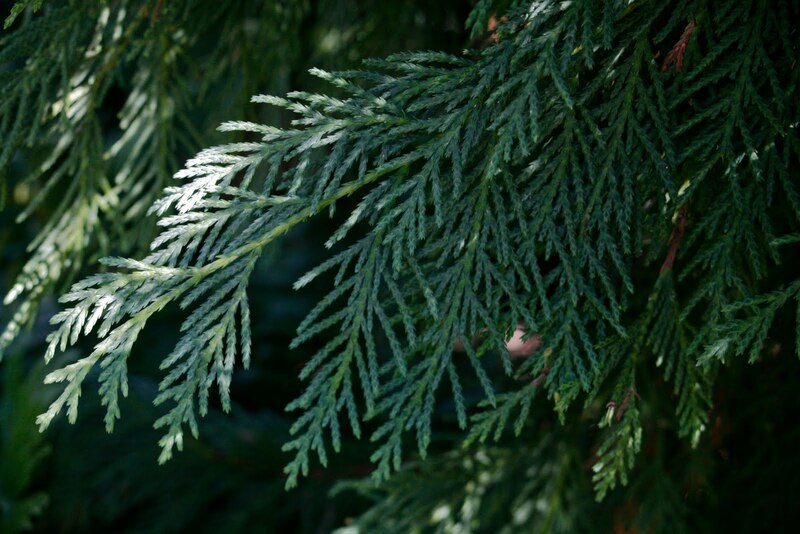 Needles are dark bluish green, 2 to 3 1/2" long, 5-fascicled, with a whitish tinge, persisting 2-3 years, tufted at ends of slender branchlets. 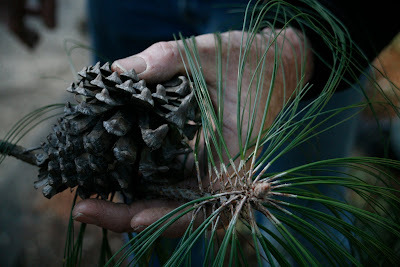 Cones are the largest of all pines at 10-20" long (! 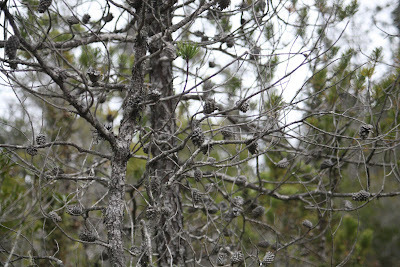 ), cylindrical, 3-4" in diameter, light brown, with shiny tipped scales with a darker inner surface and sometimes a glop of pitchy sap, ripening in late sumer of the second year and shedding dark brown to blackish 1/2" flattened seeds with a 3/4-1" long rounded wing in fall. 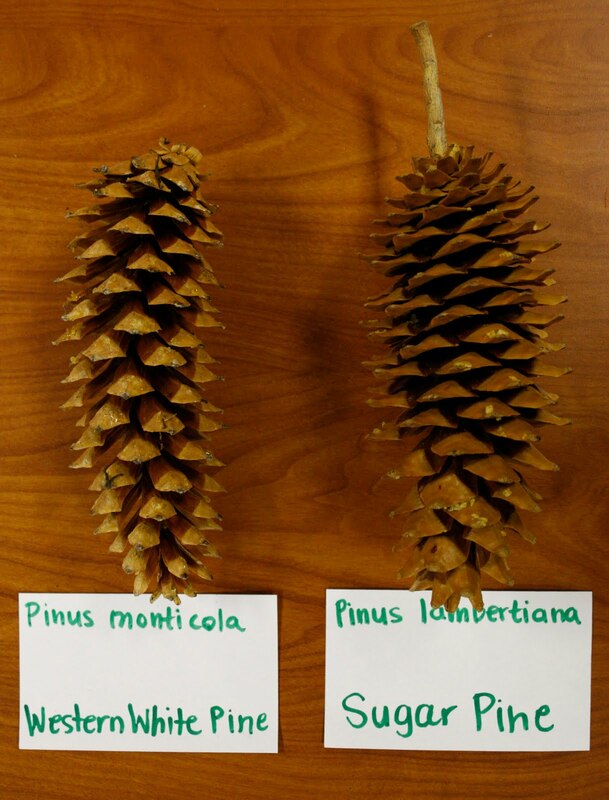 P. lambertiana has thicker cone scales, more horizontal cone scales compared P. monticola's thinner, descending scales with a light colored tip that contrasts with the darker inner cone scale. 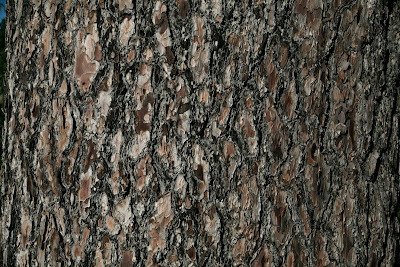 Bark is thin, smooth, and grayish becoming grayish brown, deeply furrowed with long irregular plates along the ridges.